For today I brought you a recipe for a quick but delicious pasta dinner. If you are a fan of olives and capers, you will definitely love it. Cook spaghetti following orders on wrapping. 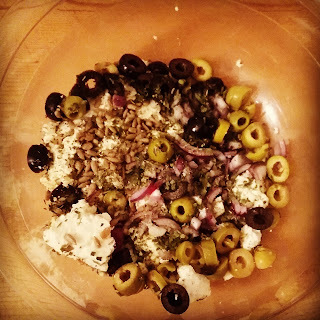 Cut olives and capers in half. Cut the onion and Feta in small pieces. Put them in a cooking pot and add the sunflower seeds. Pour some olive oil on it and add the spices. When the spaghetti is cooked give it to this mix as long as it is still warm and stir it. I LOVE both olives and capers so I'm so excited to try this out!